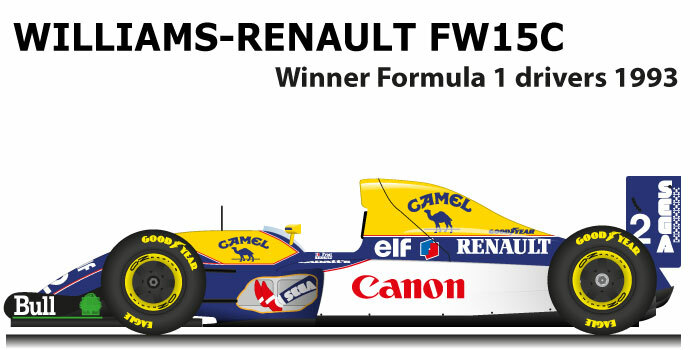 The Williams Renault FW15C was designed by Adrian Newey and Patrick Head for the 1993 F1 World Championship. The car was based on the previous model of the Williams FW14B, which dominated the 1992 World Championship with Nigel Mansell. The combination with the Renault engine was perfect, the technology mounted on the Williams Renault FW15C is considered among the most important, the active suspension and the anti-skid system, are among the systems brought by the British manufacturer and will be banned since 1994. Thanks to his political strength, Alain Prost managed to take the place left by World Champion Nigel Mansell (who decided to go racing in the Indycar Championship), to the detriment of Ayrton Senna who had now reached an agreement with Frank Williams. The Williams Renault FW15C, thanks to its superiority, won the F1 World Championship with Alain Prost who had the best of a fantastic Ayrton Senna. Thanks to the points won by Damon Hill Williams also won the constructors’ championship. Prost won 7 victories: South Africa, San Marino, Spain, Canada, France, Great Britain, Germany.